The middle child of any family often gets the short end of the stick. Neither the captain of the ship nor the young one who gets all the limelight, they are often just left to their own devices, fending for themselves in the shadow of their other siblings, regardless of their achievements. 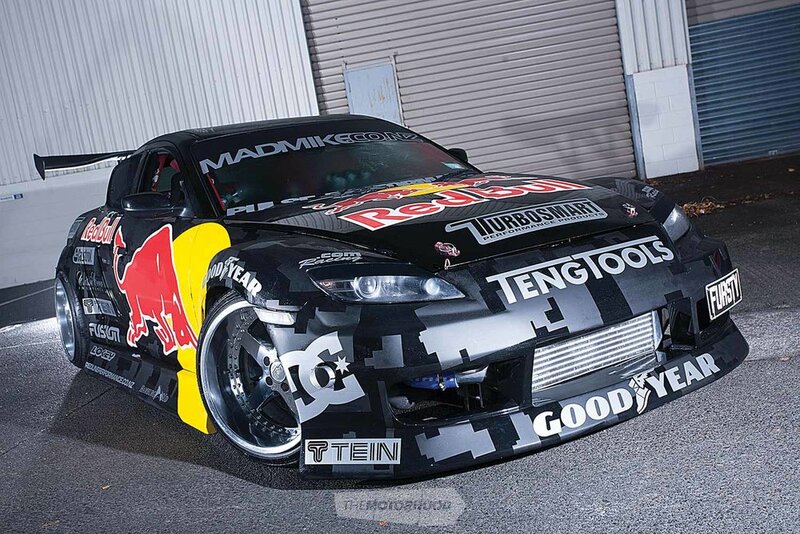 In the stables of drifter ‘Mad Mike’ Whiddett, that position is, without a doubt, held by the RX-8 dubbed ‘BADBUL’. It’s not the most insane and latest BUL (that’s ‘RADBUL’, the MX-5), and it’s not the crowd favourite ‘MADBUL’, the RX-7, but the fact of the matter is that, from the day it rolled out of the workshop, the RX-8 has been a solid performer for Mike, and it’s the car in which he feels the most competitive behind the wheel, as evidenced by the long list of podiums, including winning the NZ Drift Nationals in its debut season. The journey kicked off in 2009, just after Mike signed with Red Bull, and began his climb to becoming the world’s best-known drifter. Opportunities started rolling in thick and fast, but there was a problem. Shipping the FD all around the globe took time, time that Mike didn’t have, as he was still contesting two national drifting championships here in New Zealand. A second car was needed, and needed fast, and while a sister RX-7 to MADBUL would have been the easy route, Mike — being Mike — wanted to push the boundaries and build something that many considered ugly at the time, including himself — the SP3 RX-8. The answer came in the form of a Production Series competition chassis that just happened to be for sale at the right time. It was essentially a stock RX-8 with a roll cage, and Mike even hit Pukekohe with it in this form before it went under the knife to emerge on the cover of NZ Performance Car Issue No. 153 as ‘Fursty’, aka BADBUL. At the time, no one was making kits for the RX-8, and a local bodykit maker, Lowkey, came up with a highly modified BN Sports kit using parts from the FD kit. 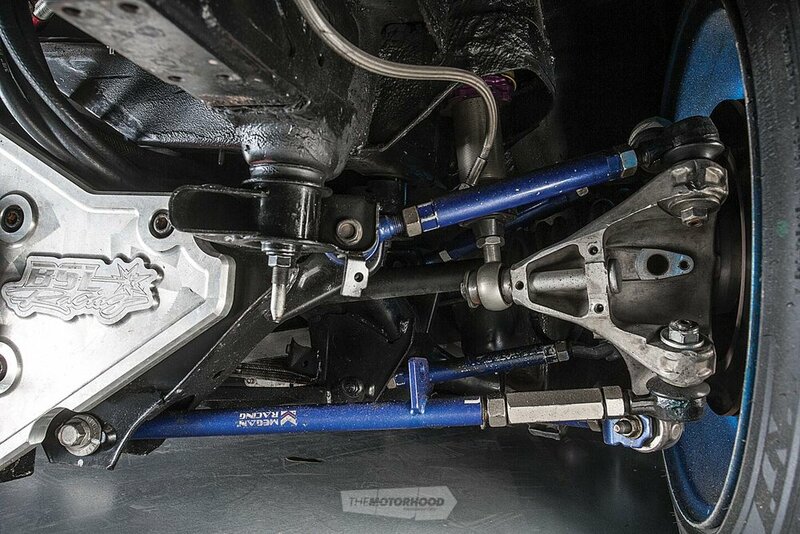 Under the hood was a Pulse Performance Race Engineering (PPRE)–built 20B bridgeport. 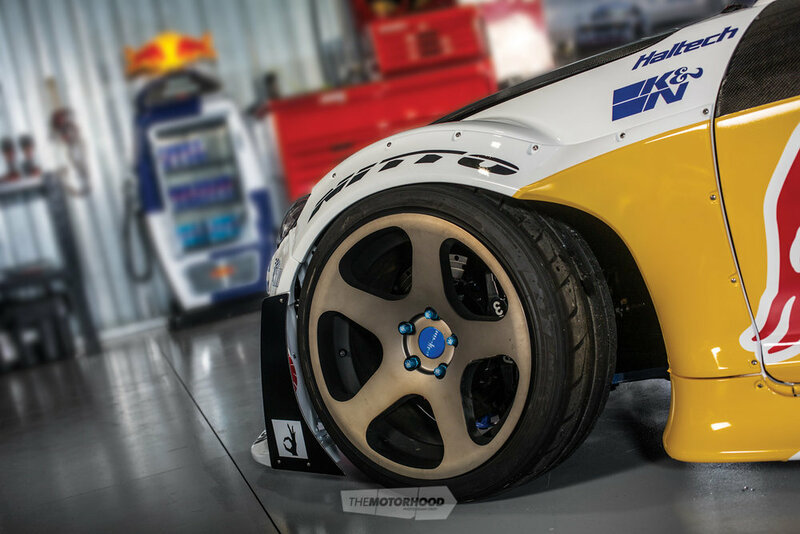 “The RX-8 was instantly easy to drive and competitive, considering that (like the MX-5) we had no data to go off. There were no off-the-shelf parts available for the chassis, so we had to build everything. But that’s just what we like to do as a team, being the first to do something and just figuring it out. With drifting, everyone has their own drifting style, their own personality, and it all shows through the builds, that’s why I like to do everything ourselves and that leads to my own style out on track,” says Mike. That style was personified by the look of the car. It’s always been low, extremely wide, and really looked like no other RX-8 on the planet. And, despite its form, the function was there, enough to podium every round of its debut season in the NZ Drift Series and earn Mike his one and only national title, while also placing second in D1NZ. That year, the team zigzagged the country with the RX-8, and it developed a ton as he learned the ins and outs of running in Formula Drift. “We managed to get some good results, we made it to the top 16, and I always ended up battling with Dai Yoshihara, who was the current champ. Each time I went up against him, we would go OMT [one more time]. It was really good to know that we had the pace to go up against the current champion — it was freaking rewarding. And to have the reliability with the car, it just didn’t miss a beat,” Mike says. Over the next six years, the RX-8 travelled the world, spending time touring Europe, Asia, and the Middle East as part of Team Need for Speed. It attended the World Time Attack Challenge (WTAC) in Sydney, took out Drift Shifters locally, and transported Lord March up his own driveway at the Goodwood Festival of Speed, before heading to South Africa to shoot Conquer the Cape. It has seen nine years of abuse touring the globe and was often left for extended periods gathering dust in the workshop while its other siblings took the limelight. So what possessed Mike to completely rebuild the car after so long rather than just move on to building something new? 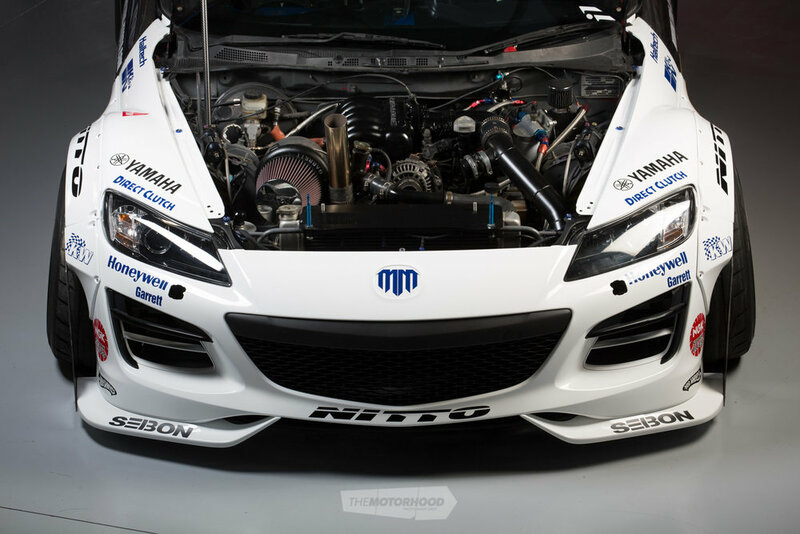 So, while the RX-8 has never failed to be competitive, especially here in New Zealand, we are now staring down the barrel of a proper race car — the potency of RADBUL mixed with a longer wheelbase, which makes for a much easier car to drive when Mike is right on that ragged edge. For the rework, Mike sat down with Kei Miura of TRA Kyoto, aka Rocket Bunny fame, to work on a new look — and if you ask us, the Pandem style has never looked so good on the chassis, thanks mostly to the shape of the RX-8 front guards. But the rebirth has gone much deeper than slapping on a new kit, with the conversion to the latest-model R3 RX-8 front and rear clips and the removal of any and all of the eight years’ worth of bent panels often hidden behind the fibreglass. A fresh set of Lexan windows went in, including a Sandbrooks heated front screen. Years of wiring and other electronic gizmos were removed from under the dash, and the final pieces were a new livery, and, of course, a fresh wheel combo. Like all Mike’s projects, the car all came together moments before being strapped into a container for its next world tour, this time heading to the WTAC in Sydney. A brief test revealed great promise, and Mike feels that the car will be very competitive right out of the box. That means that it’s finally the race car it always dreamed of being, and the one thing we can’t deny is that it still hasn’t sold out and conformed to the Formula Drift build format — for that we salute Mike. THANKS: Thanks to our partners for their continued support; Red Bull, Mazda, Nitto, ilabb, Rocket Bunny, Garrett Turbo by Honeywell, Rotiform, Haltech, KW Suspension, Hampton Downs Motorsport Park, Holinger, Seibon Carbon, Takata Racing, Wilwood Brakes, PWR, Next Level Racing, Driveshaft Shop, K&N Filters, NGK Spark Plugs, Direct Clutch, Diffs R Us, Hamill Engineering, Hybrid Lab, Yamaha, Sandbrook Glass; thanks to the creators, engineers and innovators for their time and dedication; Kei Miura of Rocket Bunny; Glenn and Brendon at Mazda; Gareth and the boys from Pulse Performance; Brad Tik; Mike Squire; Paddy and team at Independent Truck Spray Painters; and special thanks to Toni for management, support and encouragement, and to the future of Mad Mike Motorsport, Lincoln and Jett Whiddett.